Spread ice control materials quickly and easily with an efficient Hiniker Spreader. Snow removal contractors looking for additional profits will find them in ice control. Private users and municipalities will benefit from the labor saving efficiency of the wide 25 ft. spread pattern. And a big 1.50 or 1.80 yard capacity means you’ll spend your time productively, rather than constantly reloading. 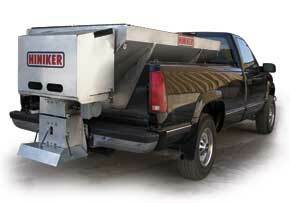 • Spread salt, sand, or chips quickly and easily with a Hiniker high-capacity 1.5 or 1.8 yard V-box spreader.